Panel 1 of 6 shows a man seated on a chair at a table. On the table is a box with dials which is apparently a two-way radio set. In his left hand the man holds a document close to his face. In his right hand the man holds a microphone that is connected to the two-way radio set by a thick coiled cord. The man speaks into the microphone. Man: HQ to Rover One, we have the reverse-engineered deactivation code for the captured nuclear bomb. Man: The code is: four, slash, seven. Voice from two-way radio set: This is Rover One. Confirming four, backslash, seven. Panel 2 shows a different man wearing a headset and kneeling on the ground. In front of him a laptop computer rests on a box that lies on the ground. Wires lead from the laptop to a rectangular object that has positive and negative terminals, i.e., terminals bearing labels "+" and "-" respectively. More wires lead from the laptop to a cylindrical object. The cylindrical object has various markings on it and lies on the ground on its side. Voice from headset: No! No backslash! It’s four, forward slash sloping to the right, seven. Man: Roger, HQ. To the right. Like a kid sliding. We see from cloud-shaped outlines that the man is imagining a child sliding downwards and to the right on a playground slide. An arrow pointing down and to the right indicates the direction of movement of the child. The slide itself is shaded grey. Panel 3 shows a scene similar to that of panel 1. The man at the two-way radio talks into the microphone again. 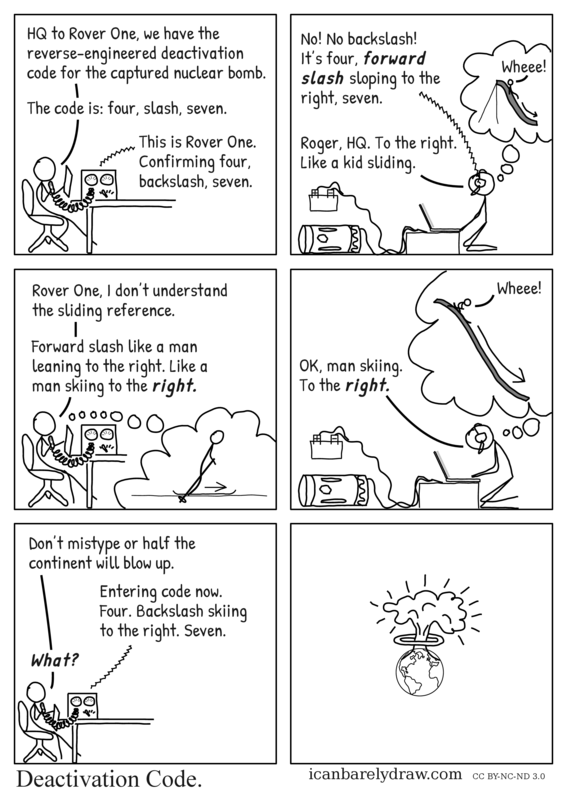 Man: Rover One, I don’t understand the sliding reference. Man: Forward slash like a man leaning to the right. Like a man skiing to the right. We see from cloud-shaped outlines that the man is imagining another man standing on skis, holding ski poles, facing to the viewer's right, and leaning forward, i.e., to the viewer's right. A right-pointing arrow indicates the direction of movement of this imaginary man on skis. Panel 4 shows again the man who was leaning next to the laptop. He kneels closer to the ground, stoops down, and looks at the laptop and types into the keyboard. The same wires, leading to the object with positive and negative terminals and also to the cylidrical object, are seen again. Man: OK, man skiing. To the right. We see from cloud-shaped outlines that the man is imagining another man wearing skis and carrying ski poles sliding down and to the right along a ski slope. An arrow pointing down and to the right indicates the direction of travel of this man on skis. The ski slope is shaded grey. Imaginary man on skis: Wheee! Panel 5 shows the man at the two-way radio again. Man: Don’t mistype or half the continent will blow up. Radio voice: Entering code now. Four. Backslash skiing to the right. Seven. Panel 6 shows the earth with a mushroom cloud expanding above it.